Herbert Mercer was commissioned in Edinburgh Artillery Militia 6/4/81, transferred as Lieut from 3rd Bde Scottish Div RA to 3rd Drgn Gds 30/1/84, promoted Capt 8/4/90, Maj 3/4/97, Lt Col 2/7/04 and Bt Col 2/7/07. 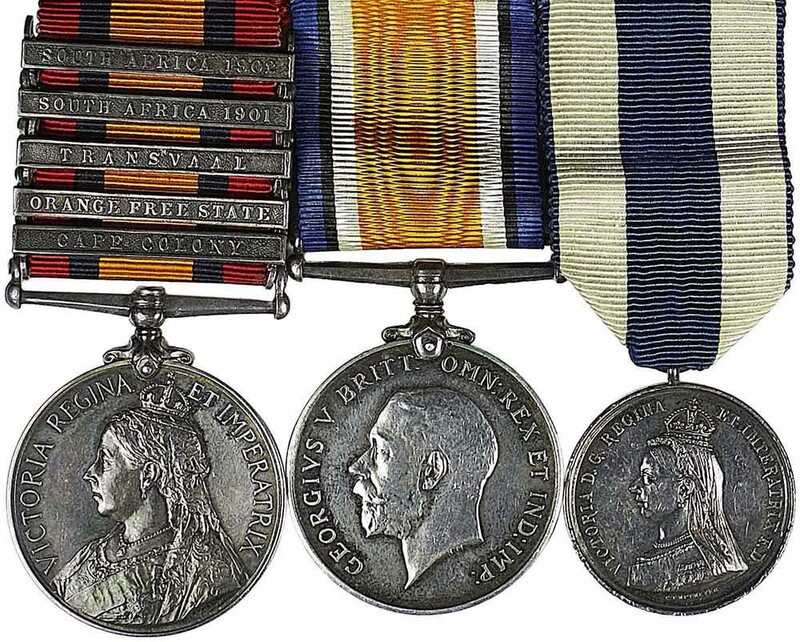 He served in South African operations in Transvaal May & Jul 1901, ORC Feb 1901 to 31/5/02, Zululand Frontier Sep-Oct 1901. Frederick Walter Huntley was born in Folkestone, enlisted in 3rd Drgn Gds 15/6/98, awarded the RVM personally by the King during an official visit to Aldershot on 15th July 1910 where Huntley carried the Royal Standard, landed France 31/10/14, wounded 13/11/14, transferred to RFC as a Disciplinarian 9/8/15, LSGC in Army Order 333 dated Oct 1916, promoted TSM 2/5/17, discharged 16/7/19, died 20/7/33. Only 30 awards of Army LSGC to RFC and a further 8 to RAF. On the face of it, a pleasing group and certainly worth having for the LSGC alone.